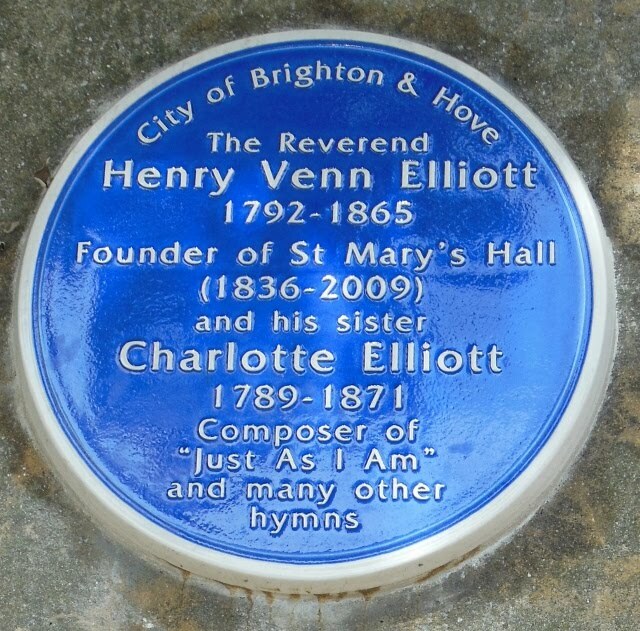 Plaque to Henry Venn Elliott and his sister Charlotte at the entrance to St Mary's Hall, Eastern Road, Brighton. Image copyright B&HD 2013. Henry’s father, Charles, was originally a cabinet maker but later became a silk merchant and moved from London to Westfield Lodge in Brighton. Charles was married to Eling Venn, daughter of the Reverend Henry Venn (1725-97), an Evangelical, sometime Vicar of Huddersfield and a co-founder of the Clapham Secthttp://en.wikipedia.org/wiki/Henry_Venn_(Clapham_Sect). Charles and Eling had several children. The ones I have identified are Charlotte (born 18 March 1789 St George Hanover Square district), Katherine Jane (c.1791), Henry Venn (17 January 1792), Edward Bishop (14 July 1793 Paddington), Eleanor (13 November 1795 Paddington), Joseph (born and died 1797) and Basil Wood (born and died 1799). There was another daughter, Mary Sophia, who died in July 1843. 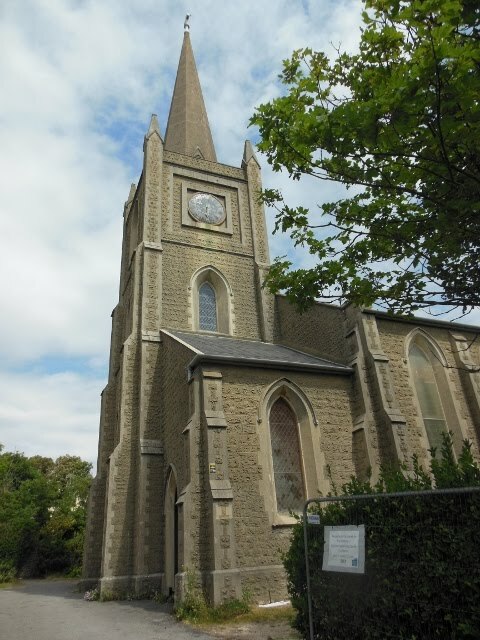 It was Charles who began the Elliott ecclesiastical activities in Brighton, when he built the original St Mary’s Church in Kemp Town (in St James’s Street, just north of Upper Rock Gardens), which was consecrated on 18 January 1827; at that time it was a proprietary chapel. Charles died on 15 October 1832, aged 82, followed by Eling in April 1843, aged 85. They are buried in the family tomb at St Andrew’s Old Church, Hove, as are nearly all of the other Elliotts who had connections with Brighton. 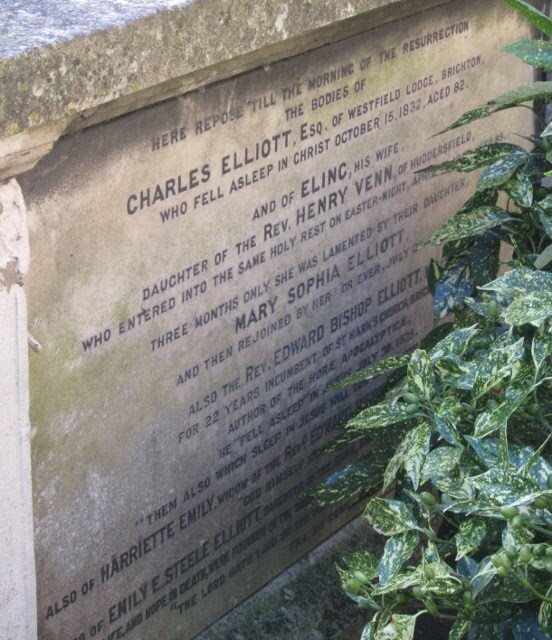 Inscription to Charles and Eling Elliott on the family tomb at St Andrew's, Hove (also their daughter Mary Sophia, son Edward Bishop and his 2nd wife Harriette Emily and the latters' daughter Emily Elizabeth Steele). Image copyright B&HD 2013. 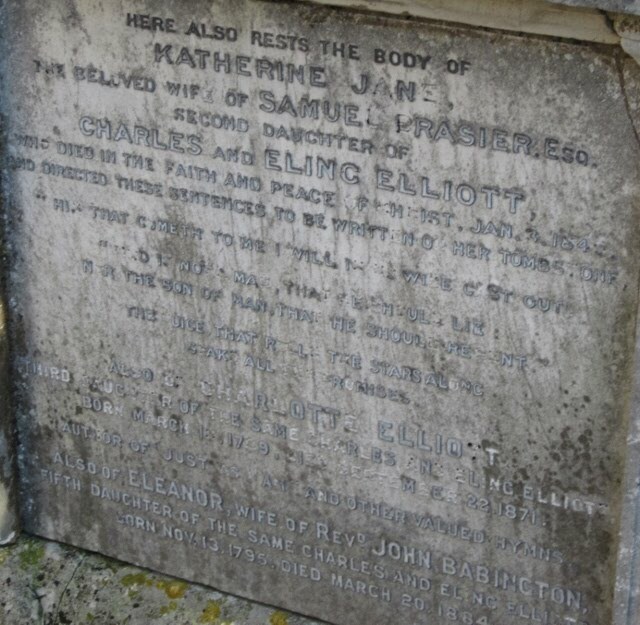 Katherine (or Catherine) Jane married merchant Samuel Brasier in 1815. Their children, as far as I know them, were John Henry (11 May 1817 Clapham) and Frances Eling (c.1821). Katherine died on 3 January 1846 and is buried with her parents; Samuel possibly died on 27 February 1859. Inscription to Katherine Jane on the family tomb at St Andrew's, Hove (also her sisters Charlotte and Eleanor). Image copyright B&HD 2013. John Henry Brasier was a barrister and had been partially blind from infancy; he married widowed clergyman’s daughter Elizabeth Cassandra Cobbold (nee Boone, born c.1835 Kensworth, Herts and died 19 December 1922) on 1 February 1859 at St John, Paddington. He died on 12 February 1894, then living at Surbiton Hill, Surrey. John and Elizabeth had a daughter, Katherine Jane (born 1863 Kensington, died 1935 Kent), who married the Reverend Hubert Knight (c.1866 Twickenham-1941 Lincolnshire) in 1895. Frances Brasier married the Reverend John Charles Whish (born c.1816 India and Vicar of East Peckham, Tonbridge 1843-93) on 2 June 1842 in St Marylebone; their children were Frances Catherine (1845), Charles William (1849), Albert Edward (1851) and Martin Samuel (1859). John Whish died on 6 June 1893, followed by Frances Senior on 28 January 1898: she was then living at 1 Grand Parade, Hastings. Frances Catherine Whish married the Reverend Francis Joseph Dewe (c.1847 Rockland, Norfolk-1902 Bexhill) in 1876. She died on 9 March 1913 in Eastbourne, but lived in Kentish Town. Charles William was in the Indian Civil Service and died in Dublin in 1915; his wife Constance Marion (nee De La Mere, married 1899) died in 1931 in Eastbourne. Albert Edward was a clergyman and married Mary Vipan (1845 Sutton, Cambs-1931) in 1877; he died on 13 March 1909. Martin Samuel, a medical student in 1881, died on 12 September 1886 at Boulogne, although he normally lived at the parental home in East Peckham; he was unmarried. Edward graduated from Trinity College, Cambridge and was a Fellow there from 1817 to 1824; he was the Vicar of Tuxford in Nottinghamshire until 1840 and was then the Prebendary of Heytesbury Collegiate College in Wiltshire. 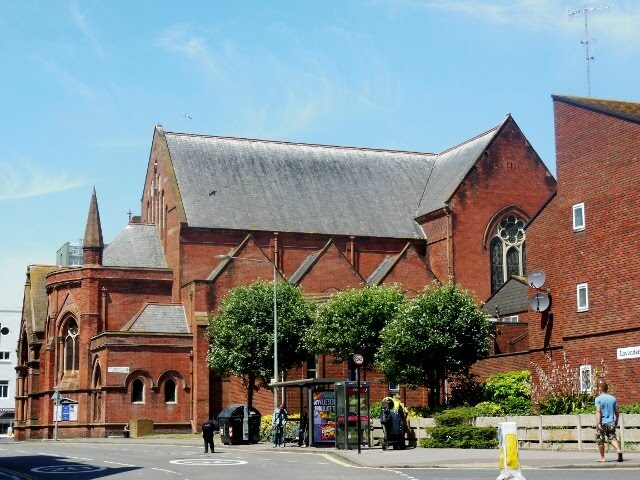 In 1853 he became Vicar of St Mark’s, Brighton, the church built by his father, a position he held until his death on 30 July 1875, resulting from a fall. He lived at 11 Lewes Crescent. St Mark's. Image copyright B&HD 2013. 11 Lewes Crescent. Image copyright B&HD 2013. In 1826 Edward married Mary King, by whom he had at least two children, being Edward King (c.1829 Tuxford), Eugenia Money (born c.1831 Tuxford), Mary (c.1833) and Eling (c.1834 Tuxford). In 1835 he married Harriette Emily (born c.1806 Dublin), daughter of Sir Richard Steele of Dublin. More children followed and these were Emily Elizabeth Steele (1836 Brighton-1897, unmarried), Anna Maria (1837 Torquay) and Albert Augustine (c.1845 Cheltenham). Harriette died on 7 March 1899, still living at 11 Lewes Crescent. Edward King Elliott became the Rector of Broadwater, Sussex and Rural Dean of Storrington; he married Mary Ann Elizabeth Richey in 1853. Their children, all born in Broadwater, were Mary Alma Eleanor Wood (c.1854-1932 Chippenham, married Rev Francis Pilcher from New South Wales), Julia Louisa Richey (1855-1905, unmarried), Alice Joan Emily (1858-1950 unmarried), Henry Venn Wood (c.1859-1932 Weston-Super-Mare, naval officer rising to the rank of Rear-Admiral, married May Broadbridge) and Edward James (1862-1927, clergyman, later Rector of Broadwater; married Edith Helen Willey). Edward King Elliott died on 31 October 1920, still in Broadwater, his wife having predeceased him on 2 November 1909. Eugenia married the Reverend Alexander Hamilton Synge (born 1820) in Brighton in 1855; he became the Vicar of St Peter, Ipswich and died there in 1872. Their children were Alexander Hamilton (1856 Kingstown, Ireland – 1912, married Georgina Mary Graves), Eugenia Elliott (1858 Ipswich-1898 Dharmsala, India; unmarried), Isabella Hamilton (1858 Ipswich-1910 London, unmarried; lived Sheringham, Norfolk), Annie Frances (1863 Kilburn-1947 Sussex, also known as Millington-Synge), Edward Elliott (1868 Ipswich-1949 San Diego, California; businessman in USA, married Nanna Sabrina Stevens of Virginia, inherited Glanmore Castle in County Wicklow) and Percy Hamilton (1872 Ipswich-1941 London; married the Hon Ella Campbell Scarlett MD http://rch150.wordpress.com/2012/07/25/royal-columbian-hospitals-first-woman-doctor/ [divorced, died 1937] and Eliza Brenda Davis). After her husband’s death Eugenia moved to Greenwich, where she died on 26 February 1909. Anna Maria (died 23 April 1923 St Leonards-on-Sea) married the Reverend Robert Douglas Monro (1840 London-1914 St Leonards-on-Sea) in Brighton in 1875. They were both buried in St James’s Churchyard, Bushey, Herts (Robert was Rector of Little Munden in Herts at one time). The children were Annie Florence (1876 Liverpool-1933 Ryde; unmarried, lived Buxted, Sussex), Edith Elliott (1878 Everton-1950 Edinburgh, but lived Buxted; unmarried), Robert Elliott (c.1880 Holloway – 1948 Newport, Shropshire, clergyman; married Ruth Trevelyan) and Katharine Elliott (c.1883 Brighton-1961, lived Buxted; unmarried). Albert Augustine Elliott became a barrister and married Janie Paterson in 1875; he died on 30 April 1883 in Edinburgh, where he then lived. 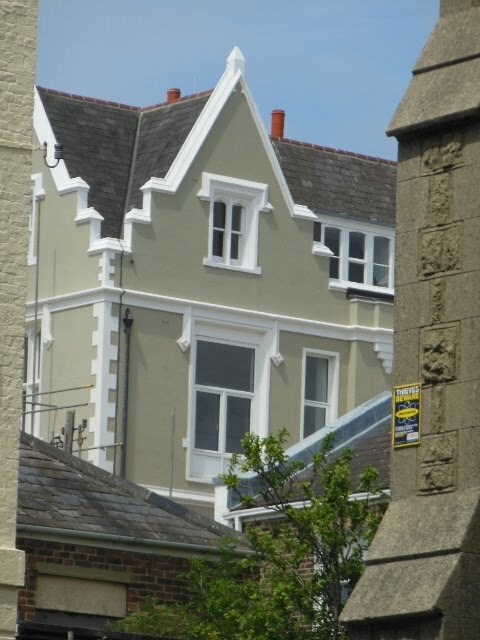 In 1855 Eleanor married widower the Reverend John Babington (1791 Rothley Temple, Leics-16 October 1885 Brighton) and they lived for many years at 10 Norfolk Terrace, where Eleanor died on 20 March 1884. Charlotte never married and was a housebound invalid for virtually all of her life; she lived in Clapham until she was about 32 and then joined the family exodus to Brighton. Latterly she lived with her sister, Eleanor Babington, at Norfolk Terrace and died on 22 September 1871. 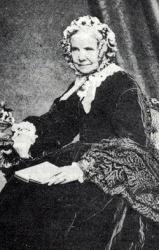 She wrote more than 150 hymns, her most famous work being the lyrics to ‘Just as I Am’, which appeared in 1835. The words are nothing special in literary terms but have been found inspirational by many of a religious persuasion and can be seen at http://en.wikipedia.org/wiki/Just_as_I_Am_(hymn). She is commemorated on the plaque at the entrance to St Mary’s Hall in Eastern Road, Brighton, along with her brother Henry. And so we come to Henry at last. Like many in the family he graduated from Trinity and became a Fellow in 1816, but overwork caused him to go on an extended foreign tour to recover his health. Brother Edward accompanied him. On their return Henry was ordained deacon at Ely in 1823 and priest at Norwich the following year. From 1823 to 1825 he was at Ampton, Suffolk and Master of St John’s Hospital, Wilton, Wiltshire 1826-32. When his father died in 1832, he inherited the chapel of St Mary’s in Kemp Town and was the minister there until his death (he had held the position since 1827, combining it with his Wilton post). Also in 1832 he conceived the idea of a school for the daughters of poor clergyman: this was St Mary’s Hall at the eastern end of Eastern Road, designed by George Basevi, and it opened in 1836. Work was almost immediately begun on the adjacent church of St Mark’s, built on land donated by the 1st Marquess of Bristol, but this did not open until September 1849: it had a capacity of over 1,000 and became the parish church of Kemp Town in 1873. In 1986 it was declared redundant by the Diocese of Chichester and became the chapel for St Mary’s Hall. The Hall itself was taken over by Roedean School for a short period in the 2000s, but has now been bought by the Royal Sussex County Hospital to house departments which will be displaced in its planned redevelopment. Henry was a strict Evangelical, believing in rigid observance of Sundays. St Mary's Kemp Town as it is in 2013. Image copyright B&HD 2013. St Mary's Hall. Image copyright B&HD 2013. On 31 October 1833 Henry married Julia Anne Marshall (born 1809) of Hallsteads, Ullswater in the Lake District; they had five children, being Henry Venn (c.1834), Charles Alfred (1835), Eling Frances Julia (c.1838), Blanche Ellen (c.1840) and Julius Marshall (1841). Julia died of scarlet fever on 3 November 1841. 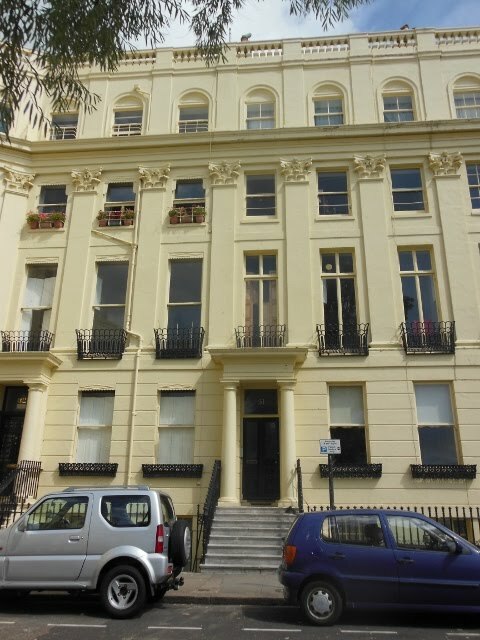 The family lived at 31 Brunswick Square, Hove and Henry died there on 24 January 1865. 31 Brunswick Square. Image copyright B&HD 2013. Two of Henry and Julia’s sons died accidentally. Henry Junior died in 1848 as the result of a fall and Julius, a keen climber and only the second man to scale the north face of the Matterhorn, died on the Schreckhorn in the Bernese Alps on 27 July 1869, having fallen whilst climbing unroped. Julius is buried in Grindlewald at the foot of the Schreckhorn. Eling and Blanche never married; the former died on 14 October 1926, then living in Addlestone, Surrey, and the latter died on 14 March 1923, then a resident of Wimbledon, but she had lived in Hastings before that. 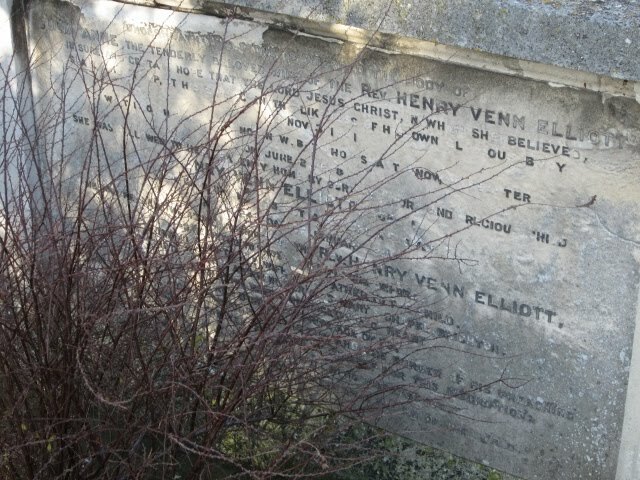 Inscription to Henry Venn and Julia Anne Elliott on the family tomb at St Andrew's, Hove. Image copyright B&HD 2013. Like so many young gentlemen in those days Charles joined the Bengal Civil Service, in 1856, and had a distinguished career; he became a member of the Viceroy’s Executive Council in 1888 and was Lieutenant-Governor of Bengal for five years in the 1890s. He then returned to England, becoming Financial Chairman of the London School Board in 1906 and a member of the London County Council; he died on 20 June 1911. Charles’s first wife was Louisa Jane Dumbell (1842 Douglas, Isle of Man-1879) and they had five children, all born in Bengal, who were Mary Amy (1867-1947), Henry Venn (1869-1922), Alfred Charles (1870 Bengal-1952), Julius Marshall (1872-73) and Frank Louis Dumbell (1874-1939). Then, in 1887, Charles married Alice Louisa Gaussen (born c.1846 Ireland) and there was one more child, Claude Aurelius (born 1888 Simla). Alice Louisa died on 8 March 1930, then a resident of Wimbledon. Mary Amy Elliott married Captain (later Colonel) Henry Richard Beadon Donne of the Norfolk Regiment on 22 June 1891 at St Leonards-on-Sea, the ceremony being conducted by the Bishop of Wakefield. They lived in Wiltshire. Mary died on 3 February 1947 in Wiltshire, followed by her husband in 1949. Henry Venn Elliott became a clergyman: he was Vicar of Send in Surrey and latterly Rector of Winslade, near Basingstoke. He died on 26 August 1922. His wife was Florence Margaret Hunter (married 1896, born c.1875 Manchester). Alfred Charles Elliott CBE married Maud Beeching in 1894 at St Paul’s Cathedral, Calcutta; at the time he was a Lieutenant in the Army (later Lieutenant-Colonel) and Assistant Commissioner of the Punjab Commission. Maud died in 1946 and Alfred on 29 July 1952; they lived at Budleigh Salterton in Devon. Sir Frank Louis Dumbell CB was Assistant Secretary at the Home Office in 1913 and Assistant Commissioner of the Metropolitan Police from 1914 to 1931; he was responsible for the introduction of one-way streets and traffic lights in London, which you may or may not regard as an achievement. He married Mabel Edith Murray (died 1952) in 1899 and died on 26 March 1939. Sir Claude Aurelius Elliott OBE http://en.wikipedia.org/wiki/Claude_Aurelius_Elliott was a historian and became headmaster of Eton College. He married Gillian Dorothea Bloxam (died 1966) in 1913 and died in 1973.